Is the New Year the new Valentine's Day? On-screen and real-life love teams made use of the holidays to be showy of their feelings for each other, and in turn, to make their fans smile. For example, Joshua Garcia, can't help but be cheesy on snow as seen in an Instagram post where he is holding hands with girlfriend Julia Barreto. It was posted with the caption, "Happiness is a choice and this is mine." Enrique Gil became vocal about his feelings for rumored girlfriend Liza Soberano on Instagram too. The couple spent the Christmas together in London. As if the city isn't romantic enough, Quen, as he is fondly called, posted a photo of him and Liza Soberano with the caption, "You and I." Re-routing to Paris from London, LizQuen, met another phenomenal love team. 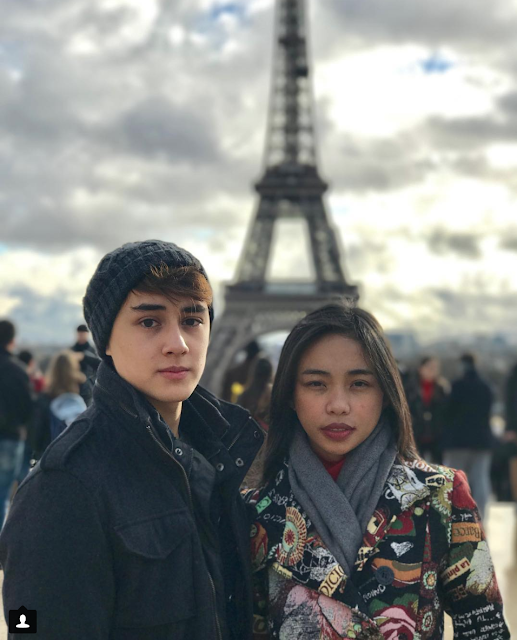 Spending some downtime before their huge Mega Magazine cover shoot, MayWard (Maymay Entrata and Edward Barber) posted some nakakakilig photos on Instagram too. This is after Maymay spent her first time in Europe at Edward's place in Germany. We can't hide the smirk on our faces with the hashtag the couple made -- #ParisTayongBaliw. Cute! Sealing all these love moments is a kiss from JaDine (James Reid and Nadine Lustre) at a New Year's countdown. You can watch the video below! Could it be more sweeter than that? They say you need to start the New Year with a happy heart. With the Instagram posts we are resharing below, let's make that a blushing heart. Photos and video are courtesy of @garciajoshuae, @enriquegil17, @edward_barber, and @vivaartistsagency.